ITEM CODE : LC-DB-13x5.5x5 GO.REX. 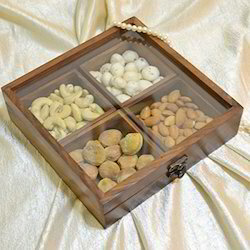 Available all kinds of Diwali dry fruits gift boxes. Small Atractive box made using wood. Polished boxes made of MDF board 6 inch x 9 inch x 2 inch outer dimension complete including printing. 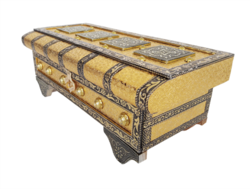 Fine Decorative Wooden Dry Fruit Box With Brass Work Available In Different Designs & Sizes. Being a leading firm in this industry, we are deeply engaged in offering a high-quality range of Wooden Decorative Craft Item. We are reckoned as reputed manufacture, trader and supplier of a vast assortment of Designer Wooden Dry Fruit Boxes. We have received immense recognition amid patrons by providing quality approved Designer Gift Box. We offer a wide range of wood mother of pearl finished to our esteemed clients. Fabricated using high quality wood and colour , these products are complimented with traditional finishing. Perfect for any modern decor, these are widely appreciated for its contemporary designs and appealing look. In addition.